It was a sunny August day last summer, on our way home from a week in rainy-Allegany when Dan and I decided to stop at one of many antique shops along the side of the road. 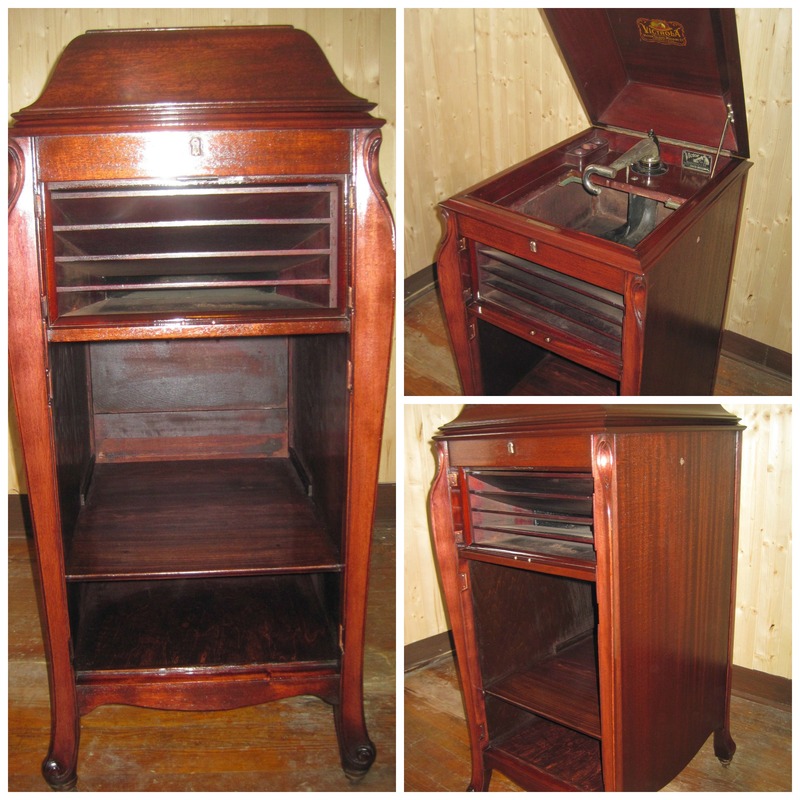 It was there that we stumbled upon our next project, an old Victrola phonograph cabinet. Of course, we couldn’t resist bringing this baby home with us. It was a bit of a scramble to find the missing pieces we needed. But alas, we made it happen, and once we had it up and running, the only record we had to test was the one the phonograph came with. We cranked that bad boy and the second music started playing, I knew it was fate. Out came the sound of the Buffalo Sabres theme song, playing loud and proud. I was so excited (its the little things, right?). The sound was a bit scratchy, but it was music to my ears. Now that we had the mechanics up and running, it was time to figure out how to build in the wine rack. 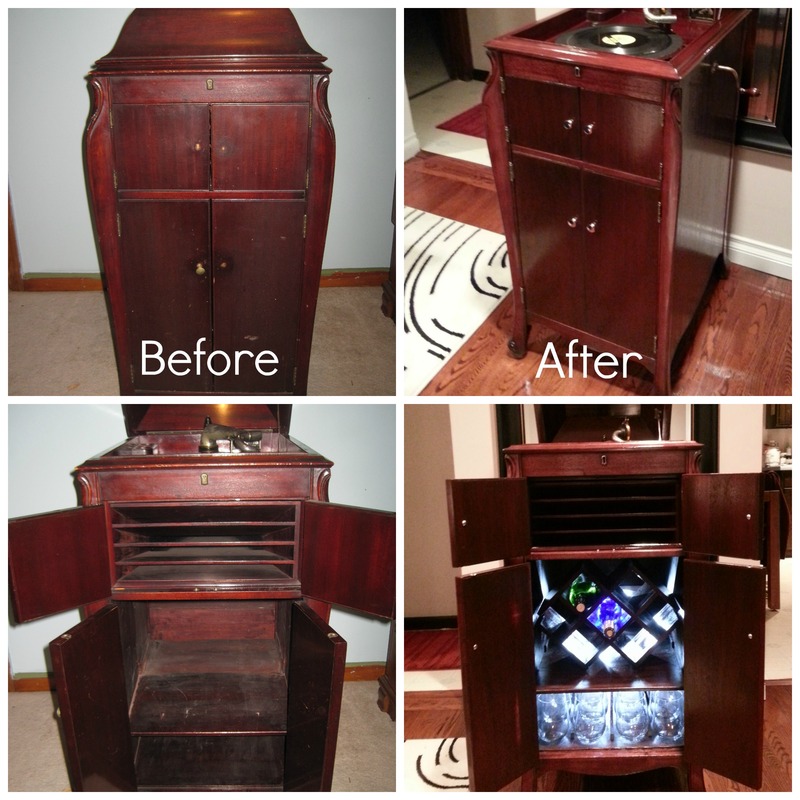 At first glance, we thought we’d just clean up the outside and bottom cabinet, build a wine rack and set aside a place to store glassware. 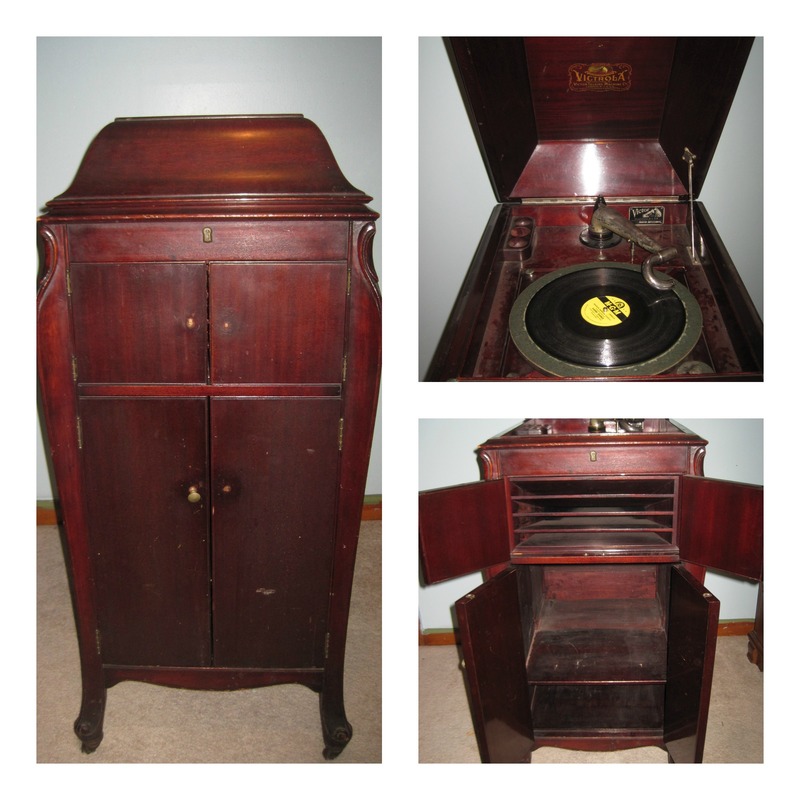 But, after a second, third, and fourth look, we realized that the entire right side of the cabinet was water damaged, and the beautiful dark cherry that covered the rest of the phonograph was gone. 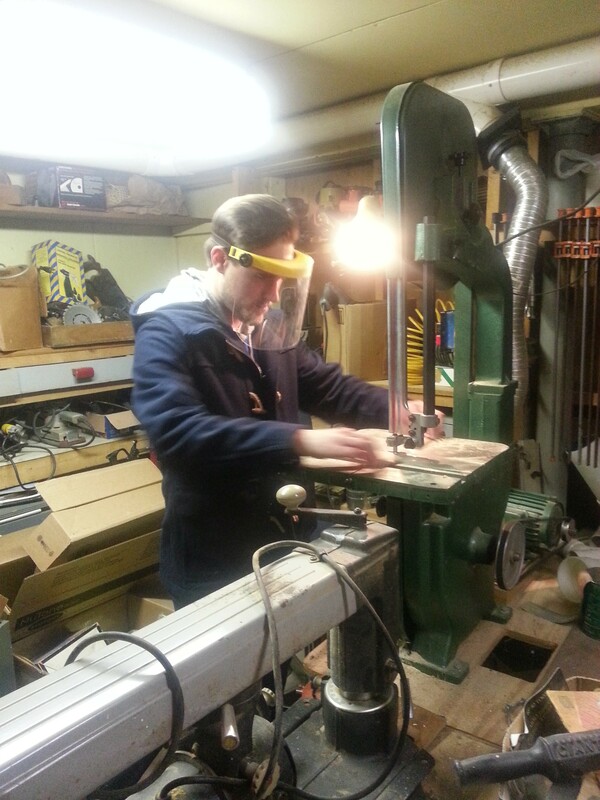 And that meant… we were back to stripping, sanding, staining, and polying (our favorite routine). 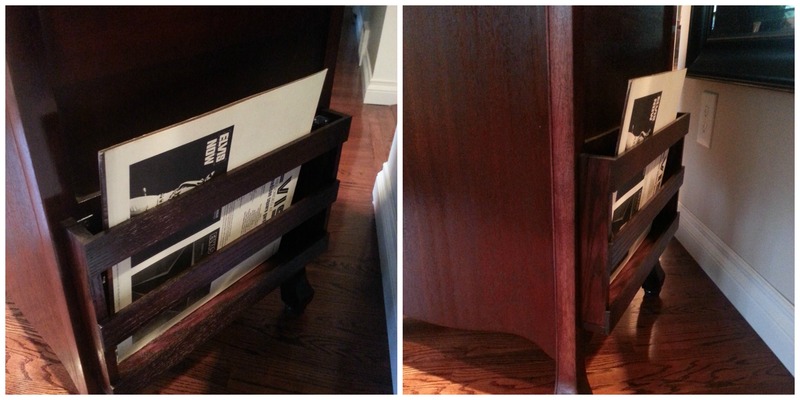 We decided to keep the inside intact, and restore the outside back to its original color. We must be getting good at stripping and staining, because it wasn’t as tedious as usual (although, it was cold. We worked out in the garage on 10 degree days, bundled up like the kid in A Christmas Story). 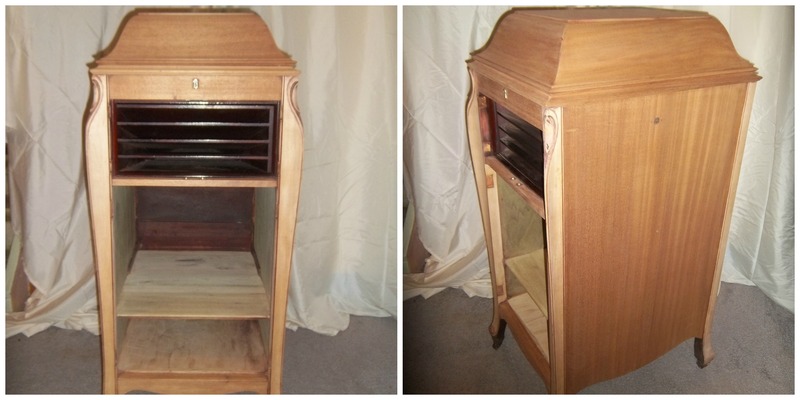 Luckily, Dan’s parents went out of town for a week, so we were able to sneak the phonograph into his basement and use a second coat of stripper there. Not sure we would have lasted much longer out in the cold, and the paint/poly came off 10x easier. Plus, we were able to get away with them not knowing (until they read this, of course). After moving the phonograph back to my house, we attempted to stain in the basement (again), which caused a big stink (literally) with my landlords (better known as my parents). This left only one option for polying, and that was to take the phonograph over to my Nana’s back cottage that she was in the process of renovating. New stain and poly in progress. Thank goodness for Nana and her back cottage. 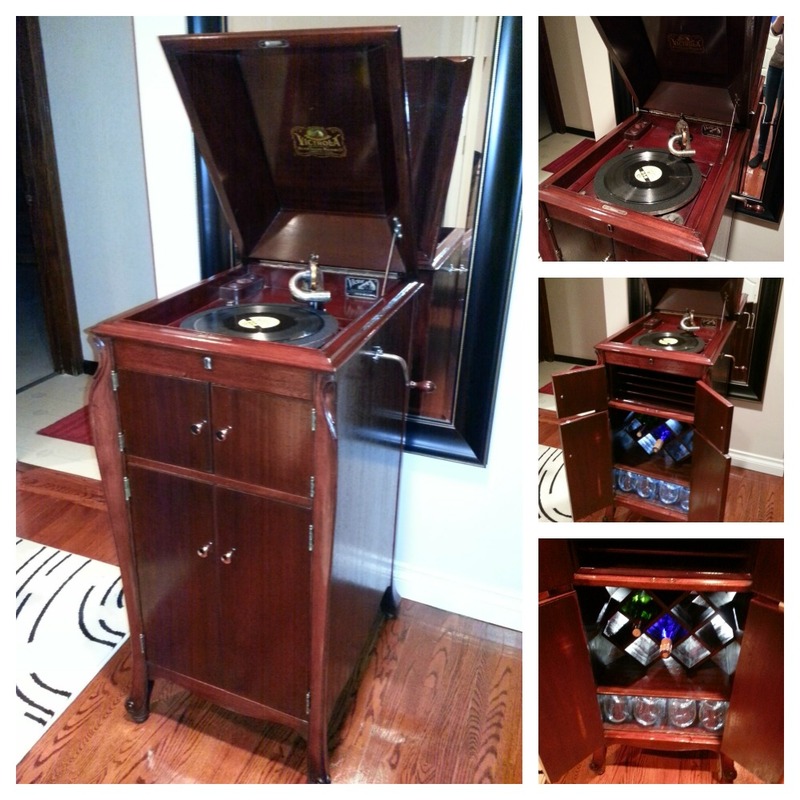 After using a dark cherry stain, adding five layers of poly, and moving the phonograph all over town, it was shining as bright as it did in 1929. 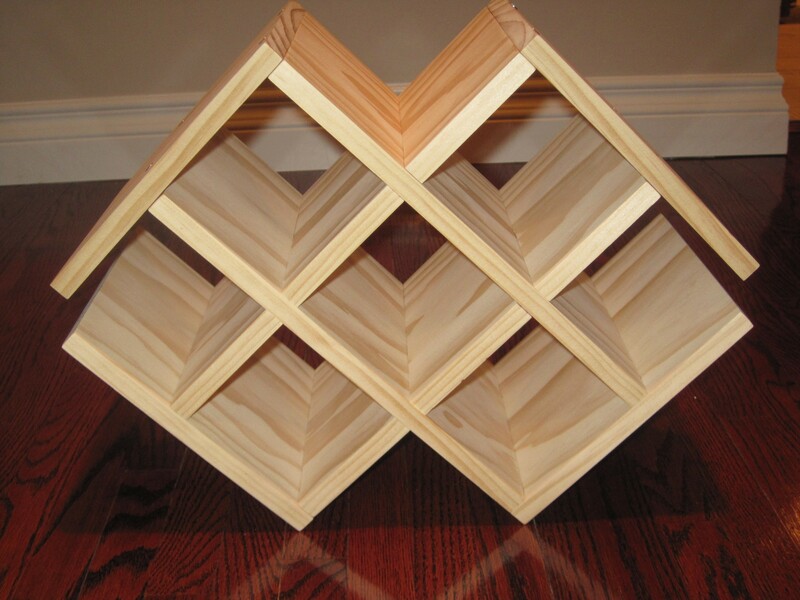 We then built the wine rack and added strips along the bottom of the cabinet to hold our stemless wine glasses. Dan also built a towel rack for the inside of the door (which turned out to be alot more trouble than you’d think) and an album holder in the back, since we took up all the storage room in the cabinet itself to house the more important wine bottles. 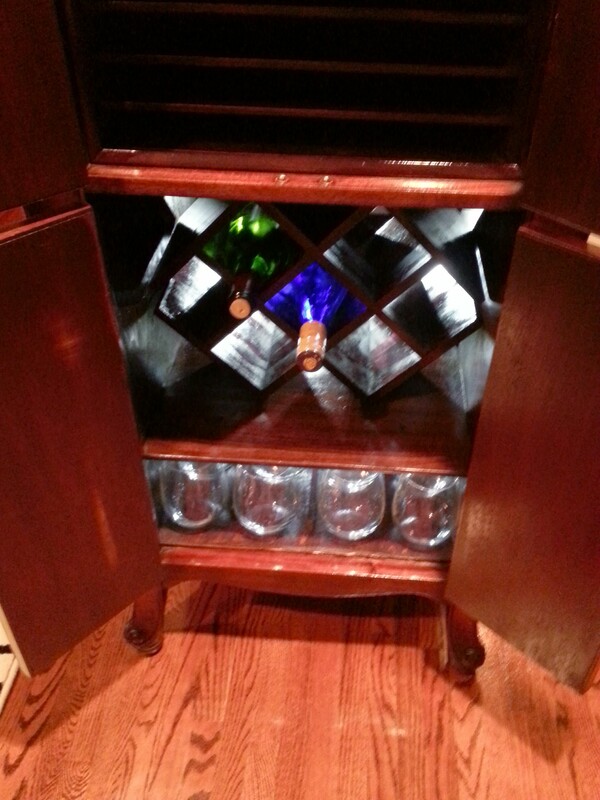 We then added back-lighting to the inside cabinet, which shines right through the glasses and bottles, giving it a really cool effect. 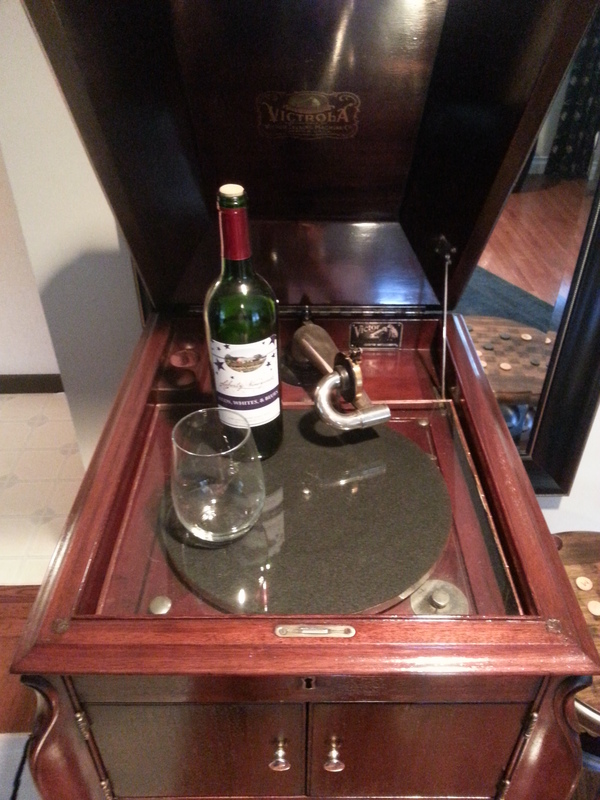 The last piece we added was a custom-cut piece of glass (courtesy of Dan’s uncle) that rests on the turn-table when the phonograph’s not in use. This acts as our makeshift bar-top when serving wine. 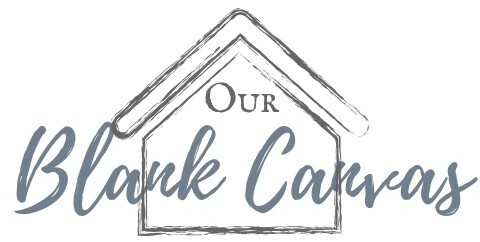 A long project that got us through an even longer Buffalo winter. In the end, it turned out better than I could have imagined, and I can’t wait to make use of it in our own house together.